Here’s how the top manufacturers use engineering to take bold strides in trainer design. What makes the perfect trainer? Sports trainers: they must look great and function even better. There are a huge number of variables to consider: stability, cushioning, comfort, weight, impact absorption, durability, traction and the prevailing fashion trends. So the first step in trainer design is to carefully consider the intended use. Who are the trainers going to be worn by? What are they going to be used for? For example, a female athlete’s running shoe has different design demands than a male shotput athlete’s footwear. As with so many engineering disciplines, carefully studying the end goal is often the best place to start. That’s why teams of bioengineers study foot and leg movements in a variety of sports, developing a list of design criteria based on their findings. This combined with principles of biomechanics and materials science, contributes to the ongoing quest for sports footwear that improves athletic performance. There are few disciplines where footwear is scrutinised, tweaked and revised, like in running. Most amateur runners will be familiar with the term gait analysis. However, the gait analysis performed by top running footwear manufacturers goes way beyond what you might be used to at your local running shop. The manufacturers of running footwear have a tough challenge. For it to be successful in the mass market, it must meet a broad range of biomechanical requirements. Yet each runner is unique. Each runner has their own specific biomechanics; their own specific anatomical structure, range of movement, gait and running pattern. This must be reconciled with the footwear variables of shock absorption, flexibility, fit, traction, weight, durability, breathability and more. To help square the circle, bioengineers use high-speed photography to film runners at up to 500 frames per second. This footage is then meticulously analysed, frame by frame. Motion-capture markers are placed at key points – such as the hip joint and the back of the shoe – and monitored using infrared cameras. These signals are converted to numerical data for mathematical analysis of each point of the running cycle. Bioengineers also use a device called a force platform to measure the variations in force generated as the foot lands, which can be up to two-to-three times as much as the runner’s bodyweight. This helps designers to create trainers with shock absorption features that help to reduce the pressure on a runner’s joints and prevent injuries. There’s a lot of money to be made from comfortable running shoes that can help to prevent injuries and improve performance. The top manufacturers employ all kinds of secretive strategies to make sure their products are the best and most innovative on the market. For instance, Reebok employs an expert who used to work as an engineer for NASA. Nike has a hi-tech lab – complete with running track – that’s bristling with advanced motion analysis systems. Adidas meanwhile uses finite element analysis simulation to banish time-consuming rounds of real-world testing. By combining FEA simulation with their extensive running data, Adidas can use the FEA software to – among other things – predict the optimum stiffness of the heel units for each different shoe size, with variations for different running surfaces. It’s not just in sport that engineering is having a transformative impact on shoe design. They say you can’t understand someone until you’ve walked a mile in their shoes. But shoes are taken for granted in the western world, and in many developing nations shoes are a luxury. Especially for children, who have a habit of outgrowing their footwear at warp speed. 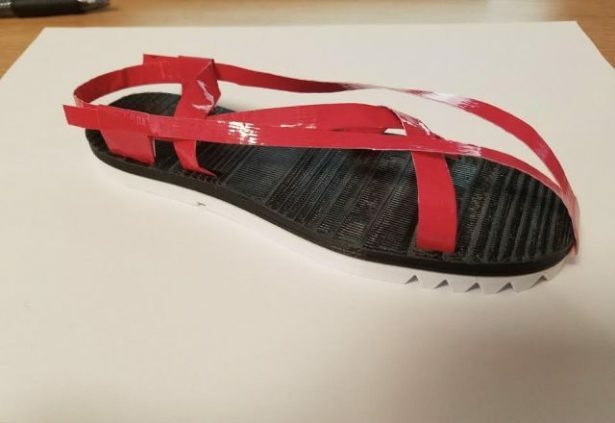 To help solve the problem, engineering students from Ohio State University were set a challenge to design an affordable, durable, expandable shoe for children in developing countries. The winning design was based on conventional sandals, with the crucial addition of a flexible toe-part that folds over a child’s foot and can be adjusted as the child’s foot grows. By using materials such as rubber and polyester webbing, the footwear is durable yet cheap to produce. In all disciplines, engineers have developed a reputation for problem-solving and innovating. Perhaps surprisingly for some, the same is also true when it comes to footwear. From sports trainers to shoes for children in developing nations, engineers have a crucial role to play in helping manufacturers tread progressive new paths.